Unlike the oceans, the sky is relatively visible and accessible to us. We are well acquainted with the range of processes that occur in the earth’s ever-changing atmosphere. We know about rainstorms that slow daily commutes and even have a growing awareness of the longterm potential dangers of global climate change. Radio, television, and the World Wide Web provide instant access to weather conditions and forecasts on demand. Airplane pilots, farmers, or people planning outdoor activities can immediately assess the value of these forecasts simply by looking out their windows, and, if necessary, they can adjust their plans based on local conditions. Daily observations and experience, combined with readily available weather forecasts, both short- and long-term, have given us a common-sense knowledge of how the atmosphere works and an ability to make informed judgments on how best to proceed in the face of present conditions. But in the ocean, the situation is quite different. Conditions and processes at work on any given day in the ocean are usually a mystery to us. Satellites may observe the surface ocean from space, but what is happening below the surface, out of sight of our orbiting viewers? Unlike the atmosphere, much of the ocean is not routinely monitored or sampled, so the only way to learn what might be going on in a particular ocean location is to visit it by boat, and, if weather conditions are especially good, dive under the ocean surface. But diving vehicles are expensive, and they provide only a fleeting glimpse of a largely unknown environment. Short-term events may not occur during a research cruise, and thus remain undetected. Critical trends that occur over large areas and long time periods are difficult to confirm with spotty coverage from ships and ocean moorings. What we require are permanent windows on the sea to help us develop the same instinctive, common- sense feel for the ocean that we have achieved for the atmosphere. That was a fundamental goal of scientists, engineers, and educators who designed and built Rutgers University’s Long-term Ecosystem Observatory (LEO-15). 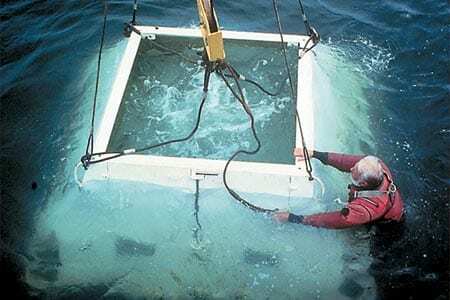 The concept began during a conversation in 1986 between authors von Alt and Grassle, then a Senior Scientist at WHOI, who envisioned a network of underwater observatories from which robots could be deployed and directed by computers anywhere in the world. These visions became a joint research program funded by the National Science Foundation in 1992. Additional support has come from the National Oceanic and Atmospheric Administration, the Office of Naval Research, the National Ocean Partnership Program, and Rutgers University. Installation and construction of LEO-15 started in 1994. The “15” comes from the system’s original and still central components: permanent seafloor nodes at 15 meters depths about 9 kilometers off the coast of Tuckerton, New Jersey. A buried subseafloor electric/fiber-optic cable extending from the field station in Tuckerton provides continuous, ample power to the nodes, which support instruments, other remote platforms, or Autonomous Underwater Vehicles (AUVs). The cable also provides two-way, real-time, high-bandwidth communications (including video) between the nodes and the field station. Linked to the Internet, the system gives scientists the ability to monitor and control experiments and vehicles from any laboratory in the world. Instantaneous distribution via the World Wide Web also offers educators and the public a direct link to the undersea world off New Jersey from classroom or home computers. 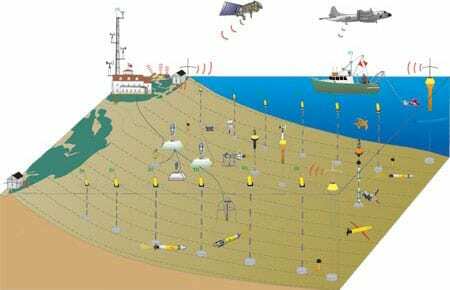 Instruments supported by the nodes measure water temperature and salinity, chlorophyll, dissolved organic material, fluorescence, and particle sizes in the water, wave heights and periods, and current speed and direction. Those observations have been augmented by measurements from a variety of sensors on an expanding network of platforms. 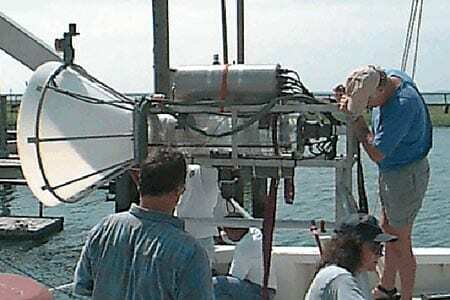 Instruments on remotely operated vehicles (ROVs), towed by surface ships, deployed on floating buoys, and housed on a coastal meteorological tower all contribute data, as do satellites and shorebased radar remote sensing systems, which can tell us about sea surface temperature, water quality, and phytoplankton content over wide areas. Together, this network now lets us continuously sample a 30-by-30-kilometer research area spanning water depths of 3 to 30 meters. This region, the inner continental shelf, has often been ignored in the past because its complex dynamics and turbulent waters have made both scientific studies and operating conditions difficult. Yet it is a region that has important impact on people. Much the way meteorologists use continuously available atmospheric data to create weather forecasts, we can assimilate ocean data into numerical computer models that simulate ocean dynamics and generate forecasts of ocean conditions that would be useful to fishers, beach visitors, scientists, and others. In a well-sampled ocean, developing trends from model-generated forecasts can be compared with the trends in rapidly updated observations to see where the model is staying on track, and where it is drifting away from observed behavior. Just as weather forecasters develop a feel for the biases of different atmospheric models, ocean forecasters will start to develop the same feel for ocean models. The ability to operate in a well-sampled ocean profoundly affects ocean research. Ocean models use the laws of physics to extrapolate how current conditions will likely evolve into future conditions. But because the ocean is under-sampled, models may start with incorrect initial conditions and end up off course. Because intensive sampling of given ocean regions is too expensive, a science called “adaptive sampling” has evolved. Adaptive sampling uses model forecasts to identify regions where additional data are critical, so that scientists can focus their limited sampling resources in these critical regions and improve the model forecasts at reduced cost. In the well-sampled ocean, errors in initial ocean conditions would no longer poison the accuracy of ocean model forecasts from the start. Instead, errors would more likely result from imperfect understanding of the physical processes going on in the ocean. That fundamentally shifts the still critical role of adaptive sampling: Instead of focusing on sampling to improve the accuracy of initial conditions, adaptive sampling systems could focus on regions where crucial physical processes are poorly understood or highly sensitive. These measurements would improve scientists’ ability to understand underlying physical processes, to verify the models’ accuracy, and to keep the models on track if their results begin to deviate from observed conditions. Once we begin to get our own common-sense feel of ocean processes, we can begin to ask what a fish, diving bird, porpoise, clam, or starfish sees during a lifetime in the ocean. With our air-bound sensory equipment and inability to be present during many important oceanic events, we have not been able to visualize, let alone experience, the habitat of any ocean creature. Whenever scientists have had a more continuous presence in the marine environment, major advances in understanding have occurred. Frequent visits to intertidal rocky shores to conduct experiments have demonstrated the importance of interactions among individuals of different species with each other and their environment. Underwater observations by divers on a daily basis have provided insight into the behavior and life cycle of reef fishes and corals. From the submersible Alvin, deep-sea ecologists received their first view of the ocean floor and the responses of some of the inhabitants to their surroundings. These advances were achieved simply by extending our visual and manipulative capabilities into the ocean. With LEO technologies, the environments not visible to human eyes can be visualized and studied remotely for the first time. Our inability to routinely observe the ocean and its life compromises our ability to apply usual landbased management practices in the marine environment. We once believed the oceans could sustain any demand on their resources and could accommodate all but the most extreme assaults from exotic chemicals and any amount of excess nutrients. These ideas turn out to be untrue. The success of our ports requires efficient, safe traffic management, reduced sediment contamination, and better methods for using dredged material beneficially. Coastal economies will benefit from real-time information about beach conditions. Better tools for predicting and rapidly responding to coastal hazards such as storms, erosion, toxic algal blooms, and oil spills can minimize the harm they cause. Naval commanders have enormous interest in new methods to reconnoiter unfamiliar and possibly mined beach landing zones. Improved understanding of marine ecosystems and the need to manage living marine resources requires information about the habitats of all stages in the life cycle of each species and about the interactions among species and their physical surroundings. With additional new technology (high-resolution color satellites, piloted and autonomous aircraft, floating radar stations, and long-duration AUV gliders), LEO-15 will be able to expand its reach toward deeper-water shelf areas, further north and south along the shelf, and into shallower water at the outer edge of the surf zone. We hope it will eventually become part of a national and ultimately global network of coastal observatories. 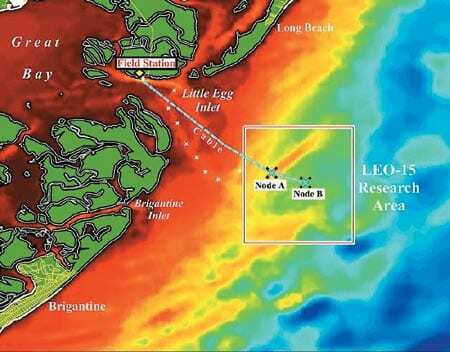 Other LEO systems are planned by Rutgers and WHOI in the Mid-Atlantic Bight, including deeper stations at the edge of the continental shelf and shallower stations offshore Martha’s Vineyard, and in some of our nation’s busiest ports, such as New York and New Jersey. Other universities are implementing LEO-like systems along our coasts and in the Great Lakes. The challenge will be to link this patchwork of local well-sampled systems in a distributed national network that shares regional-scale information. More information about LEO-15 is available at: http://www.marine.rutgers.edu/mrs/LEO/LEO15.html. 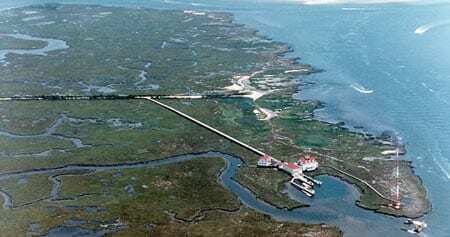 Rutgers University's Marine Field Station in Tuckerton, New Jersey, is the headquarters of the Long-term Ecosystem Observatory (LEO)—a network of sensors taking continuous, realtime observations of a swath of coastal ocean. A backbone component of LEO is a subseafloor cable supplying power and two-way communications from the field station to permanent seafloor nodes, which, in turn, support a variety of instruments. At LEO, instruments supported by permanent seafloor nodes are complemented by a wide range of measurements taken by robotic vehicles, satellites, aircraft, research vessels, shore-based radars, and by instruments on buoys and on the field station's meteorological tower. 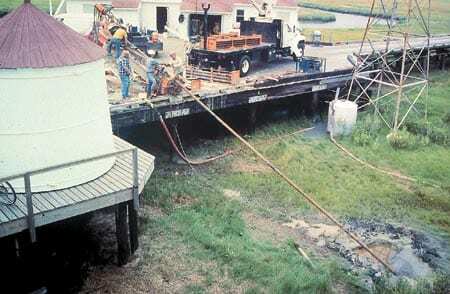 LEO's cable from the field station is directionally drilled underneath a marsh and intercoastal waterway and toward the continental shelf in 1994. 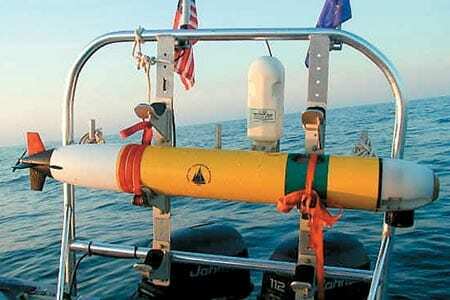 The WHOI designed remotely operated vehicle REMUS (Remote Environmental Monitoring UnitS. An underwater docking station where REMUS can upload power or download data. One of LEO's seafloor nodes is deployed.